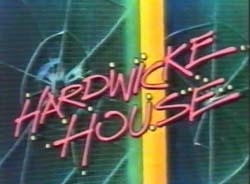 Today is the twenty fifth anniversary of the very first airing of Hardwicke House. And tomorrow is the twenty fifth anniversary of the very last. Hardwicke House was a star filled, high-profile comedy set in a comprehensive – Grange Hill shone through the prism of ITV sitcom. But it was their new, late night flavour of sitcom, tinged with fashionable ‘anarchy’ – the snarkiness and mock brutality that had almost become standard in the the thrall of of alternative comedy. A later, unbroadcast episode even featured the Comic Strip stamp of approval: cameos from Mayall and Edmonson. ITV had great faith in it, showing the first extended episode the day before its regular, weekly slot. It had plenty of jokes, but what it became notorious for was the callousness of teachers and pupils alike. In one episode a teacher tricks a new girl into electrocuting herself, while elsewhere the school hard boy, played by a youngish Kevin Allan, forces his victims to eat raw liver. At a forensic level, the broadcast episodes are no more violent than, say, the Young Ones, but to my eye, it shared the harder edge of ITV comedy of the era. The programmes it aped usually found their scattergun destruction landing on the hubristic and foolish, but Hardwicke House and some stablemates – especially the New Statesman – appeared to set up characters as insipid or pathetic and then punished them for it. Its mischievous and sometimes witty, but still with a nasty taint of laughing with the bullies. Perhaps because of the setting, and almost certainly because of the pre-watershed time slot, the programme was particularly effective at animating criticism. Between the two broadcasts, the writers and lead actor were held in television’s equivalent of the stocks, soaking up righteous abuse on the phone-in show Open Air. After the second, liver and electrocution episode, the show was tarred and feathered by the tabloids, and then withdrawn forever by the broadcaster. There’s an excellent write up of it all here. So along with its dangerous content and effective banning, Hardwicke House has earned a third distinction. Plenty of sitcoms have been shunted around the schedules, and some abandoned after a single outing. But, I’m guessing, at two episodes in two days, Hardwicke House can claim to have the shortest run in the history of British sitcom. Hello, the guy who wrote the Off The Telly article here! Thanks for linking to it – if anyone’s interested, there’s a longer version with more details and the weird story of what actually happened to the tapes, in a book I’ve self-published – http://www.lulu.com/product/paperback/well-at-least-its-free/15533611 – which I hope you won’t object to me plugging…!! This was originally to have been a DVD booklet, but the proposed release ridiculously fell through when the show failed ‘compliance’. Maybe if enough of us make enough of a noise ITV will relent…! Cheers!